About seven thousand National Grid customers on Aquidneck Island still have no heat, and the utility says the problem will take days to fix. A dangerous interruption in the gas supply has National Grid teams going door to door, turning off meters as a safety precaution. Representatives say the worry is that when they turn the gas supply back on, any pilot lights left on could cause an explosion. Until the problem is fixed, some Newport residents are making due with blankets and space heaters. When Niko Merritt’s heat went out on Monday, she and her three kids bundled up. “We had to be in layers all night, each of us has 3 or 4 blankets on. And we have space heaters at home but that’s not sufficient heat,” Merritt said. So when Merritt heard yesterday that National Grid was giving out hotel vouchers, she hurried to pick one up. “I saw a post on Facebook, and I came to check out and see if it was true,” Merritt said. “And it was true, and we got here on time to get a voucher.” Steve Patti was also at Gaudet Middle School to pick up a hotel voucher. But he didn’t have time to wait in line. His plan for tonight? Others waiting in line for hotel vouchers were frustrated by the hour-long wait time to talk with a National Grid representative. All Newport Public Schools, the Newport Public Library, and the Lifespan Physician Group primary care practice are closed because of the gas interruption. And among the apartments without heat: all Newport Housing Authority properties. Executive Director Rhonda Mitchell, said, “We’ve got a couple hundred properties that do not have heat right now, so we’re going wellness checks to residents, particularly those that are vulnerable populations, our elderly and disabled.” Mitchell directed anyone looking for shelter Gaudet Middle School in Middletown, where The Red Cross is operating an emergency shelter. Shelter Manager Carmela Geer said the Red Cross would provide food for anyone staying overnight. “Bring your favorite blanket, bring a pillow, bring something to keep you occupied during the time because you will be in a gymnasium. But it’s nice and toasty warm here in the building,” Geer said. Two people spent the night on cots at the shelter Monday night, and Geer said volunteers can accommodate many more. During blizzard Nemo in 2013, the same shelter slept over five-hundred people. 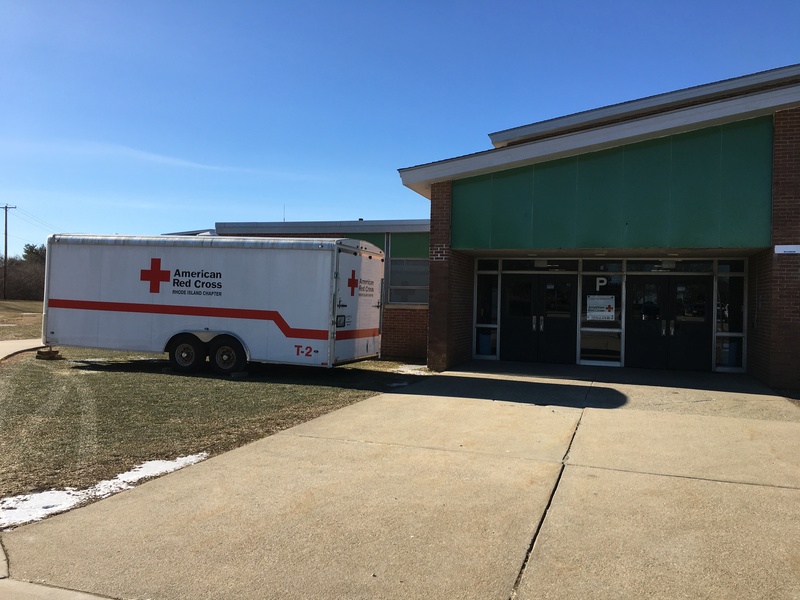 Outside the Red Cross shelter at Gaudet Middle School, January 22, 2019. 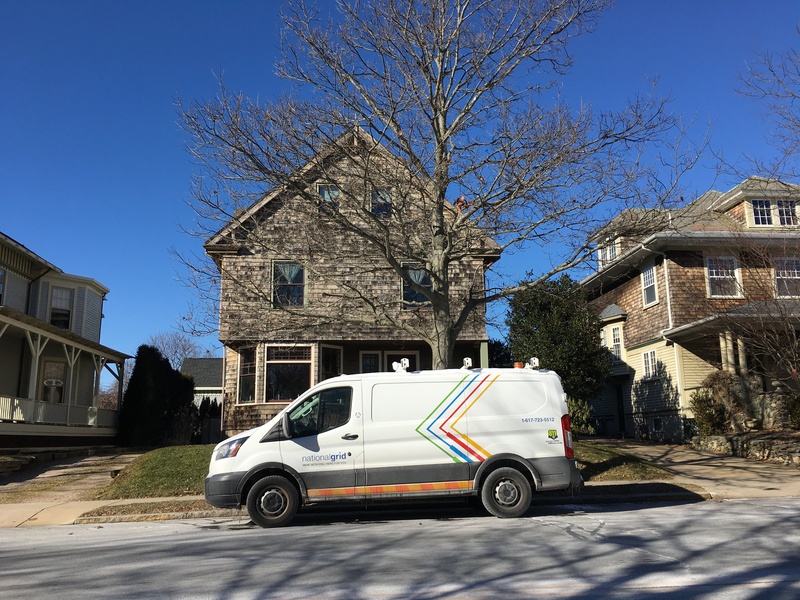 National Grid teams going house-to-house in Newport, turning off gas meters, January 22, 2019. 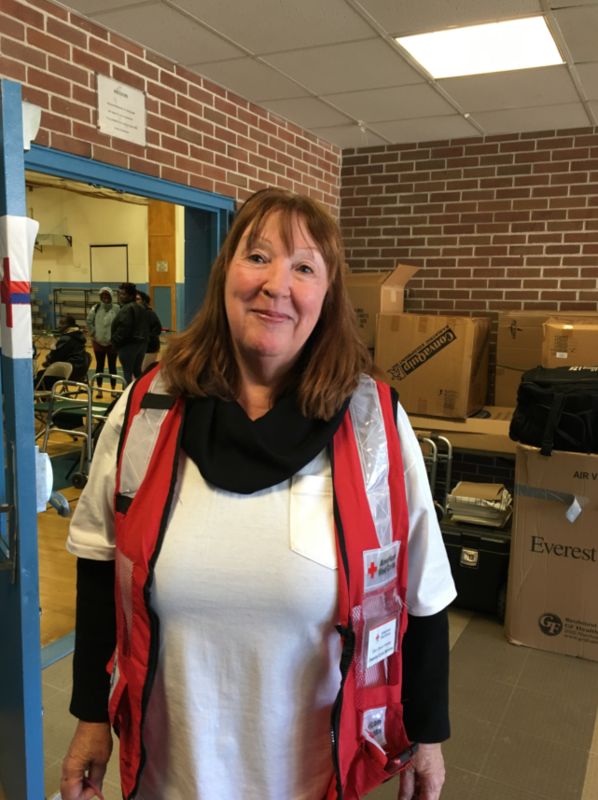 Ellyn Eaves-Hileman, a Red Cross volunteer at the Gaudet Middle School shelter in Middletown, January 22, 2019.